Two people died after a KOMO news helicopter crashed in central Seattle at the foot of the landmark Space Needle, fire officials have said. The helicopter belonging to broadcaster KOMO went down about 07:52 local time. A man in a car destroyed in the crash suffered severe burns and is hospital in critical condition, while two others escaped without serious injury. KOMO said the helicopter was trying to take off when it crashed. “There was a huge plume of thick black smoke” when fire fighters arrived, said fire department spokesman Kyle Moore. Three vehicles on the street below the broadcaster’s building caught on fire. But fire fighters prevented a fuel spill from the crash from entering the sewer system. The man brought to hospital was in one of the vehicles but managed to pull himself out despite having burns over 50% of his body, Kyle Moore said. He said investigators had no indication the helicopter struck a building. A witness told KOMO the engine of the helicopter “sounded extra heavy” as it started up and he heard an explosion seconds later. 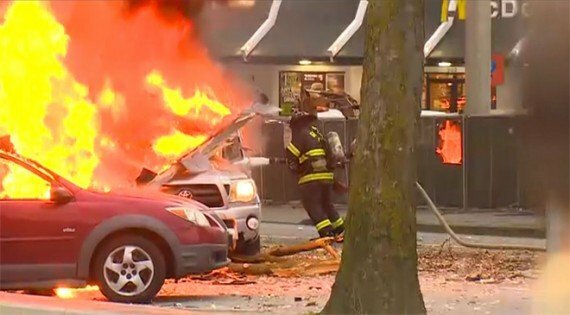 Police have told Seattle drivers to stay out of the city centre. The National Safety Transportation Board has launched an investigation into the crash.